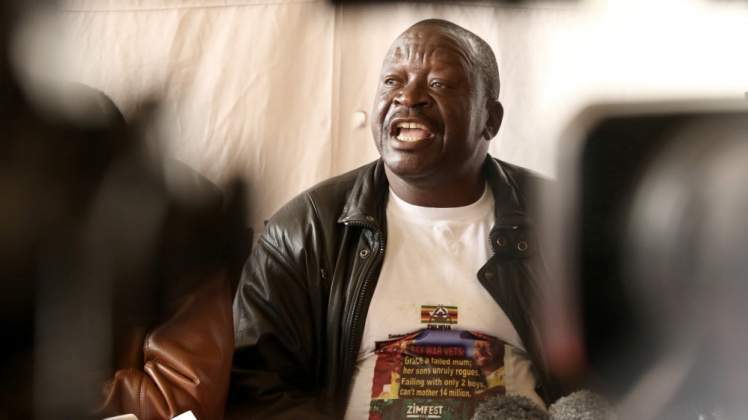 FRESH cracks have emerged in the Zimbabwe National Liberation War Veterans' Association (ZNLWVA) where secretary general Victor Matemadanda has come under attack for holding meetings without the consent of members. Matemadanda, who is also Defence deputy minister is said to be leading a faction seeking to overthrow ZNLWVA chairperson and former Cabinet minister Christopher Mutsvangwa. The war veterans' secretary-general is on a national campaign to drum up support for President Emmerson Mnangagwa's spirited drive against sanctions. However, Matemadanda's critics have said the meetings have not been sanctioned by the executive and were meant to incite structures to dump Mutsvangwa. Matemadanda, who was in Mashonaland West Province last week defended his Indabas. "I do not need to consult anyone on that because I am the most senior war veterans' representative in Zanu-PF. "Moreover, I am meeting not with ex-combatants but veterans of the liberation struggle and these include war collaborators". "People must able to distinguish the ZNLWVA's work, Zanu-PF work and government work. "In fact I am not at liberty to respond to such silly allegations by people who are ignorant. "I have better things to do," Matemadanda told the Daily News. ZNLWVA national executive member Charles Muchena said Matemadanda had not been mandated by the war veterans' executive to hold such meetings. "What we know is that such meetings are discussed at the national executive level and the chairperson should naturally know but in this case he is not aware. "I don't think the meetings he is holding have anything to do with us. "When he came to Masvingo he met with Zanu-PF structures as well as war veterans but that we thought he was acting in his capacity as deputy minister of Defence as well as politburo member so we did not worry about the nonsense that we are hearing about factionalism since it was not a ZNLWVA indaba which he is not mandated to tell what to do," Muchena said. Matemadanda and Mutsvangwa led the majority of war veterans in defending Mnangagwa at the height of Zanu-PF's deadly succession, tribal and factional fights which only ended after the military intervention which ousted former president Robert Mugabe in November 2017. However, in recent months there have been signs that Matemadanda and Mutsvangwa might no longer be seeing things the same way. In November last year, Mashonaland West and East war vets provincial executives pushed for a no confidence vote against Mutsvangwa but he had the backing of 10 other provinces which easily knocked back the plan.